I WILL always have a soft spot in my heart for Seattle's Myers Music shop. Although the old retail store is long-gone, memories of going there with my father to buy my first drum-kit in 1967 remain vivid. That little shoebox of a building (1206 1st Avenue) was crammed from floor to ceiling with racks of instruments and musical supplies of every type. The proprietor, Julius M. Myers (1906-1994), was most helpful in advising us & I ended up going home happily with a brandless Asian-made set of beautiful copper-colored "tiger-eye" finished tubs -- & a snare-drum case that bore a small metal logo badge as seen here. And it seems that I was in pretty good company: many previous local musicians had also received Myers' assistance: in the 1940s he'd sold young Quincy Jones his first trumpet, & in the 1950's young Jimi Hendrix got his first electric guitar there. 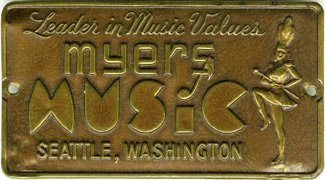 Myers -- a Romanian immigrant who originally founded his Empire Clothing Co. in 1928 (renaming it the Empire Exchange in 1931, & then eventually, Myers Music) -- was a mandolinist, a leader of a balalaika orchestra, & a radio host on Seattle's KVI. It was in 1984 that Myers shuttered his shop -- & in 1993 a large psychedelic mural was painted on the building's south exterior wall in tribute to Hendrix.